SkyBlue Cross Alternative Health: Should High Cholesterol patient have to take Satins Whole Life? Should High Cholesterol patient have to take Satins Whole Life? Without treating the underlying causes of High Cholesterol, millions of hyperlipidemia patients have to suffer the incurable disease and take whole life Statins and related side-effects.It is time for this situation to be ended. A Newest Food Heal Therapy for High Cholesterol just be invented and developed. According to CDC.gov: High cholesterol is a significant risk factor for cardiovascular disease (CVD) and specifically for coronary heart disease (CHD).Cardiovascular disease is the leading cause of death in the U.S. In fact, it kills more Americans each year than all cancers combined. Approximately 17% of all national healthcare spending[In 2015, U.S. health care spending increased 5.8 percent to reach $3.2 trillion, or $9,990 per person] focuses on this disease alone. Nowadays, most cares for high cholesterol have unique goal that is to lower the cholesterol level, they put aside the underlying causes of high cholesterol, then high cholesterol become treatable health problem, but cannot be cured; hyperlipidemia patients have to take prescription for lifelong. Hyperlipidemia is not a sickness, but kind of digestion system metabolic status instead, which may be complicated health status connected to liver, kidney, and spleen functions. Each high cholesterol patient has its particular underling cause, simply applying a lifelong taking satins prescription to all high cholesterol could be medical malpractice. There are different types of high cholesterol with different underlying causes of high cholesterol. It is terrible medical malpractice to treat high cholesterol without addressing the cause. To address the underlying cause of high cholesterol the most important key to treat cholesterol. 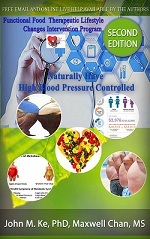 Book: "Naturally Balanced your Cholesterol Level: Functional Food Therapeutic Lifestyle Change Intervention Program" give out 14 common complex types of high cholesterol and treatment solutions which make high cholesterol become curable, and let high cholesterol patient don't need to take prescription Satins for lifelong anymore. Functional food therapeutic lifestyle change mediation/intervention program just be invented against High Cholesterol in side-effect free, effective natural health therapy way. Functional Food therapeutic lifestyle changes program demand practitioners to spend time with their patient, observing their lifestyle, considering all their interactions among lifestyle, complex chronic diseases, environment, and family genetic influence. By this way, the program can help each high cholesterol patient to treat the specific hyperlipidemia. To address the underlying causes of disease with a system-oriented approach, and to integrate both patient and medical/healthcare practitioner in an interactive natural health therapeutic partnership is tendency of 21st century healthcare. Functional food therapeutic lifestyle change mediation/intervention program makes use of the above Innovative health care philosophy and developed many especial programs for many common chronic diseases.